A few weeks ago I was picking apples from the ground in my backyard. They were imperfectly shaped and bruised and not of uniform size. Not the kind of apples found in your supermarket, which have been carefully selected, graded for size, colour and shape and washed to be ‘picture perfect’. But there was so much fruit that I was reluctant to simply throw them into the compost. On a whim, I decided to make apple cider and coerced my wife as a collaborator in this possibly foolish venture, especially since neither of us had ever made cider before. But we had inherited a wine press from her late father, so what better way to try it out on a beautiful summer day under the shade of one of our apple trees? I slipped on a pair of new Canadian-made rubber boots, somehow placed myself inside a large plastic barrel (head up!) and, as my partner in crime slowly poured in the washed apples, I stomped on them with my feet. After a few minutes I developed a rhythm and could feel the apples disintegrating under my heels: an effective apple crushing operation indeed. We then loaded all the mush and slosh into the wine press, trying to ignore the wasps that were buzzing all around. The juice quickly flowed into buckets and by the end of the day we had converted four bushels of fruit into 30 litres of juice. We pasteurized and froze some of it, but most of it is now slowly fermenting into hard cider in the cantina. It was a tiring day, to be sure, but all in all, it was most satisfying on many counts. 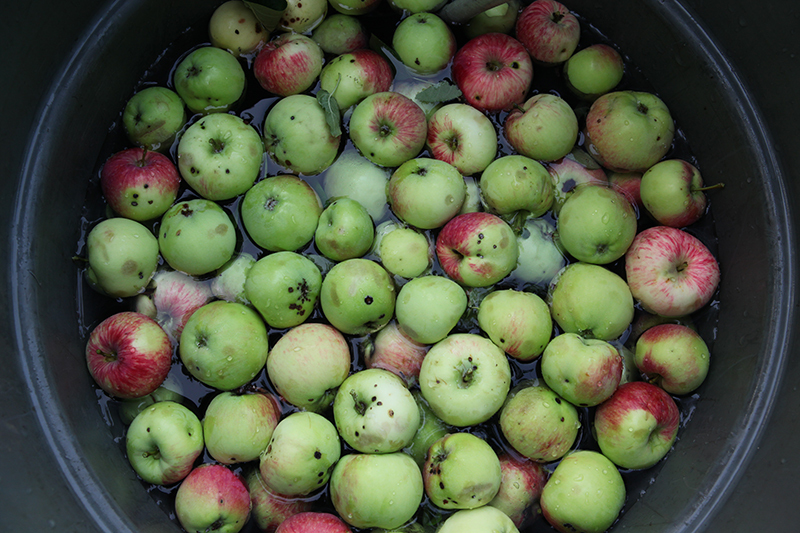 These less than perfect apples were grown completely free of any pesticide, the ‘waste’ product (the flesh and seeds that remained after pressing) went into the compost, the juice is entirely the fruit of our labours, and the carbon footprint is zero. It was difficult to walk anywhere in the orchard without stepping on what seemed a sea of apples and I found myself tiptoeing to avoid crushing any of them, all the while balancing a heavy camera bag on my left shoulder, one camera in my right hand, and one around my neck. Jamaican workers, perched on tree-tops, or on step ladders, were busy picking fruit by hand, but they acknowledged my bizarre predicament with benevolent gazes and smiles that seemed to say, “look at that wretched city slicker.” At that moment, the farmer and proprietor was passing by in his tractor. He too looked at me with that disturbingly kind smile that is usually reserved for fools and innocents. “Your Jamaican workers,” I ventured. And so that night I returned home with a huge box of fresh, free apples, and I can still savour the memory of the crisp, tangy flavour. In the early 1990s most urban people were not aware of the presence of migrant farm workers in Ontario. The concept of the 100-mile diet was still unknown. Farmers’ markets, now ubiquitous in large cities, were rare except for the large traditional places like the St. Lawrence Market in Toronto or the Farmers’ Market in Hamilton. Organic farming on a commercial scale was still in its infancy. And the food ‘revolution’ wasn’t in full swing yet. Our love of food was just that: a love for food and was neither a fetish nor a lifestyle trend. Back then, food was basically food. Now that we have supposedly expanded our cultural horizons we are very particular and specific in describing food: slow food, fast food, junk food, finger food, gourmet food, diverse foods, heritage food, ethnic food, country food, fair value food, sustainable food, and local food. The terms ‘foodie’ and ‘locavore’ have entered our lexicon; chefs are our newest celebrities; cook books are the rage; and the arrival of $200.00 densuke watermelons from Japan makes the front pages of big city newspapers. With the planet increasingly threatened by greenhouse gas emissions, this extreme culinary fetish borders on the obscene. Yet, densuke watermelons merely reflect the fact that much of our food comes from disparate locations across the globe on a regular basis. And local food is not always available to the local population, since it may be grown for export. But people are becoming increasingly concerned about the lack of locally produced foods in their grocery stores and, conversely, the need to encourage consumption of local foods. In our endless discussions about food, one crucial factor has been overlooked: the labour side of the food equation. Unlike the pleasure of a backyard harvest, growing food commercially involves an intricate system of intense farming practices which rely on the use of chemicals and pesticides, highly specialized machinery, a quick distribution system by land, rail, or air and most importantly, a readily available, low-paid work force. 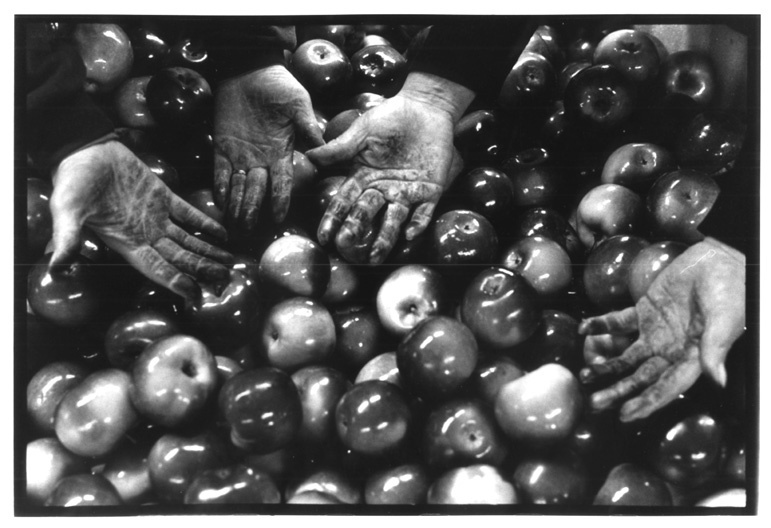 Hands and Apples, Newcastle, Ontario, 1995.©Vincenzo Pietropaolo. From the series Essential Work: Mexican Migrant Farm Workers. Apples are selected, washed, and waxed by women, for long-term storage or export. The thin coat of wax, which sticks to the workers’ hands, makes the fruit shiny. Picking apples on an apple farm is not fun: it is work. Or more accurately, it is cheap labour. Canadian farm workers in general are paid notoriously low wages and foreign guest workers, in particular, have almost none of the benefits that Canadians enjoy. Farming is susceptible to changing weather, so farm workers live right on the farm where they work, so that they can be ready at a moment’s notice to go into an orchard or a field no matter what day of the week. They cannot organize into a union and don’t get paid overtime for overtime work, they have no job security, and there is no appeal procedure for bad working conditions. They can be repatriated by their employer with no recourse. They pay for their own air transport, accommodation and food. And while they pay income taxes like everybody else, they are also required to pay into the Employment Insurance program even though they cannot qualify to make any claims. In essence, they help to finance Canadian workers’ benefits and, worst of all, they are beholden for virtually everything to their employer. It is clear that our enjoyment of food is made possible only through the exploitation of workers through low wages. It is a daily manifestation of north-south disparity that quietly hijacks our pantries into the quagmire of globalization. The labour side of the food equation is hardly ever mentioned in food shows, magazine articles, nor is it apparent in farmers’ markets including organic producers, who by using migrant farm workers find themselves in the contradictory position of having labour practices that are not nearly as progressive as their farming practices. As far as most food shoppers are concerned, the food simply appears on the store shelf and there is little interest in how it got there. Much has been said about the need to favour local food. The benefits are many and obvious: local farmers are encouraged, the local economy is strengthened, fruits and vegetable have a greater nutritional value due to freshness, organic farming practices are encouraged, community ties between rural and urban centres are strengthened. Eating local food helps us re-discover the rich taste of truly fresh fruits and vegetables and we can finally understand what our grandparents meant when they said that tomatoes actually tasted like tomatoes in the ‘old days’. Advocates of local food argue that local food results in a smaller carbon footprint. While this appears to be true on the surface, it is a misguided conclusion. Local food on a commercial scale is possible only through annual importation into Ontario of a seasonal work force of 18,000 temporary foreign farm workers, for up to eight months of the year. About 80% of fruit and vegetable farming in the province is performed by guest workers who come from Mexico, the eastern Caribbean, and increasingly central America and South-East Asia. Studies show that the greenhouse vegetable industry in Ontario—which boasts 50-acre greenhouses, the largest in the world—is predicated upon the existence of a permanent workforce of cheap labour provided by migrant farm workers. The contradiction in the local food/small carbon footprint argument is clear. Therefore, what is the true measure of the carbon footprint of an apple grown in Ontario, but by foreign guest workers? Is it a 100-mile apple, or should it be called a “3,250 km apple” (the distance between Mexico City and Toronto), or maybe a “5,000-mile apple” to take into account the long distances that farm workers travel from their countries of origin. If we add the distance for their return trip home, the picture is even worse. 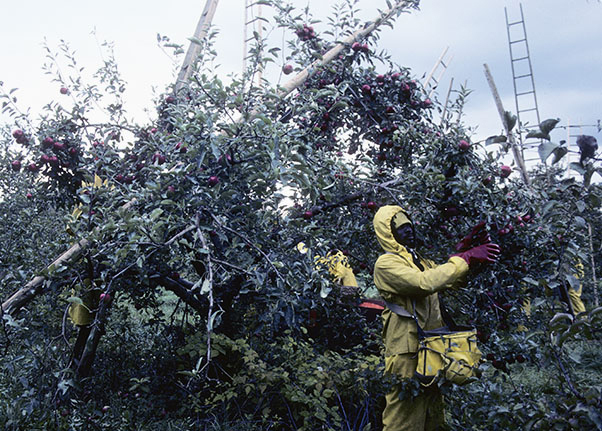 If the quintessential symbol of health, goodness, and agriculture—the apple—cannot be grown without low paid foreign guest workers who enjoy few rights, can it be truly considered a fair trade food? The same can be said for most locally-grown fruits and vegetables. So next time you bite into a store-bought McIntosh, have tomato sauce with your spaghetti, or ketchup with your fries, trace the journey of the apple, tomato, and potato and you’ll see that it’s a trajectory that begins in some village thousands of miles away in a foreign country where a farm worker boards a bus that takes him to the nearest big city airport for a flight bound for Canada. Ironically, these are often the same locations to which Canadians flock for their winter vacations, but that’s another story again. This article is part of our issue FEEDING TORONTO. I found Mr. Pietropaolo’s article in Feeding Toronto quite intriguing with its mix of agricultural economics, international trade and society’s culinary tastes. Highly recommended reading for sure. My question is simply on apples, backyard grown apples. I want to know how he avoids the fruit worms getting into his cider. Previous post ← Don’t become a victim of Election Fatigue!